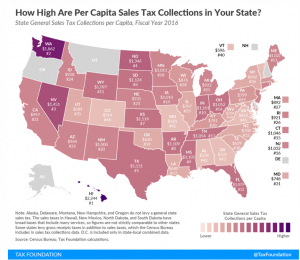 This probably comes as no surprise: The Tax Foundation reports that Washington ranks second in the nation for per capita sales tax collections. But, there’s more to it than just the state’s relatively high sales tax rate. That’s right. For all the occasional discussion about the porous, loophole-ridden Washington state tax structure, our sales tax base ranks among the nation’s broadest. That’s a good thing, as TF adds. In most states, narrow sales tax bases make the sales tax less productive (from a revenue standpoint) than it could be. Many states exempt certain goods (like groceries or clothing) from the sales tax for political reasons, but these exemptions put upward pressure on the tax rate that applies to other purchases, such as household goods or meals at restaurants. One additional factor not cited by TF: Washington has enjoyed one of the nation’s strongest state-level economies for some time. That means more money in consumers’ pockets and more investment by businesses, both of which drive sales tax collections. It’s always misleading to focus on just one element in a state tax structure. Still, we thought you’d be interested.